One of the most intimidating and downright scary activities is applying for a job and then being called in for an interview. While the job market is becoming more and more saturated, figuring out where you want to work is the first step. For those who love a sweet treat (known as ice cream), a clear and good fit would be the celebrated brand, Baskin Robbins. Why Are You Interested in Working at Baskin Robbins? What Steps Would You Take to Resolve a Problem with a Difficult Customer? What Kind of Experience Do You Have Leading Others? What Is the Most Difficult Decision You Have Ever Made as a Leader? Where Do You See Yourself Professionally in 3 to 5 Years? 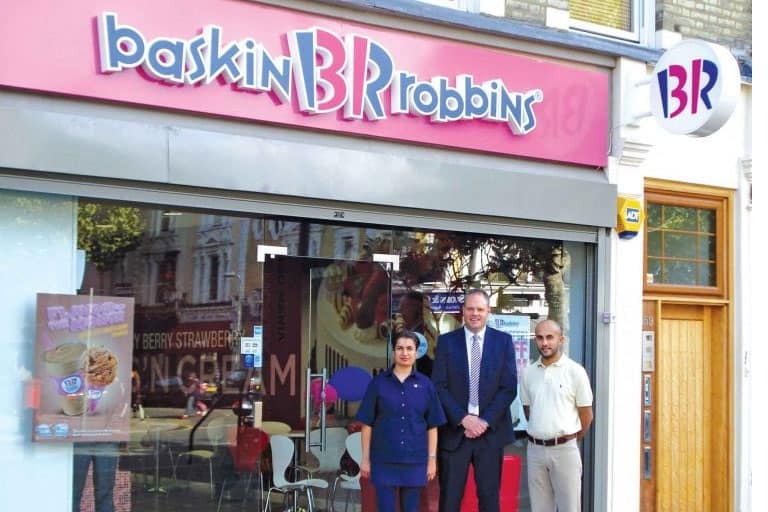 Unlike several companies, Baskin Robbins does not have an online application, and all of its restaurants are independently owned and operated by specific franchises. To apply, one must visit their local store and speak with a manager. With a minimum age requirement of at least 14 years old, all potential candidates must fill out their application in person. Although it seems like a straightforward process, there are certain pitfalls that anyone can run into during the interview process. Founded by Burt Baskin and Irv Robbins in 1945, Baskin Robbins first opened its doors in Glendale, California. The Baskin Robbins ice cream stores started as separate ventures for the brothers-in-law, Baskin and Robbins. 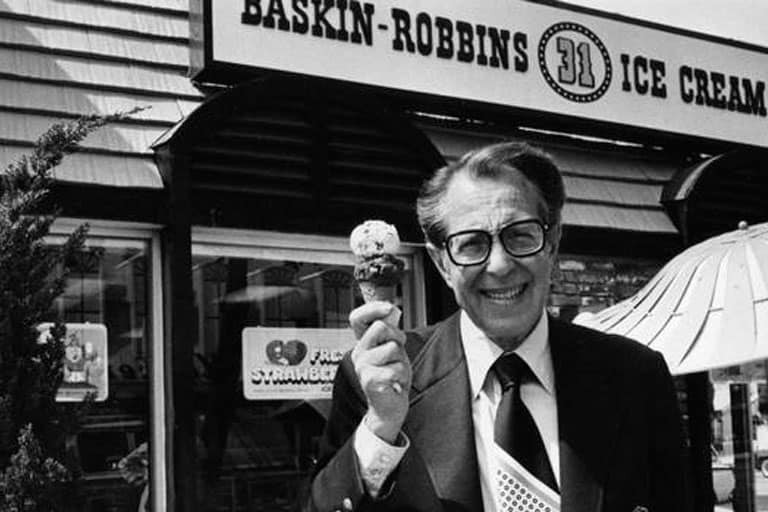 Baskin owned “Burton’s Ice Cream Shop,” and Robbins owned “Snowbird Ice Cream.” Snowbird Ice Cream sold and served 21 flavors, and after the merging of the two entities, that number expanded to 31. Owned by its founders until 1967, Baskin Robbins was then acquired by the United Brands Company. By 1970, the chain had gone international, first opening in the countries of Japan, Saudi Arabia, South Korea, and Australia. 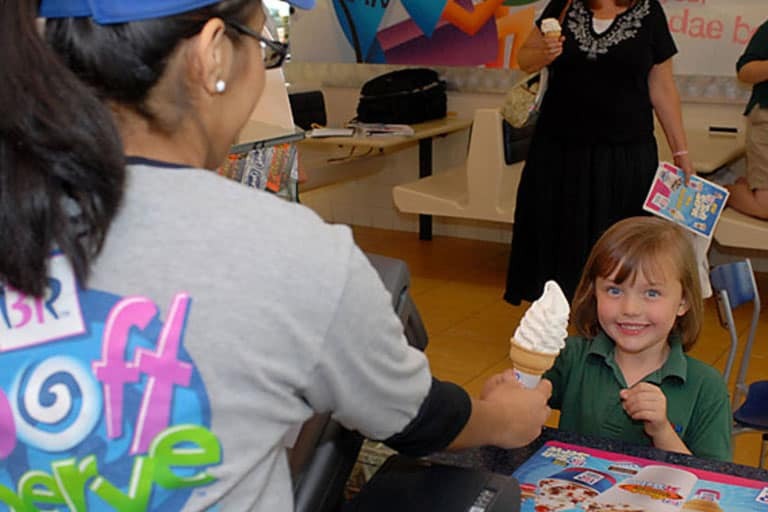 While many considered it a small ice cream shop in 1945, Baskin Robbins has expanded and now has roughly 2800 independently owned franchises within the United States. With nearly 5,000 more locations abroad, this company continues to increase its profile and staying power in a constantly shifting marketplace. The flavor profile has grown from a measly 31 flavors to more than a thousand. Though the company has expanded in flavor, their signature slogan is “31 flavors” which signifies a different flavor every day of the month. With its iconic pink and blue logo, this American chain of ice cream and cake specialties has become globally known for its incredible and delicious treats. Since 2004, Baskin Robbins has been headquartered in Canton, Massachusetts after moving from Randolph, Massachusetts. 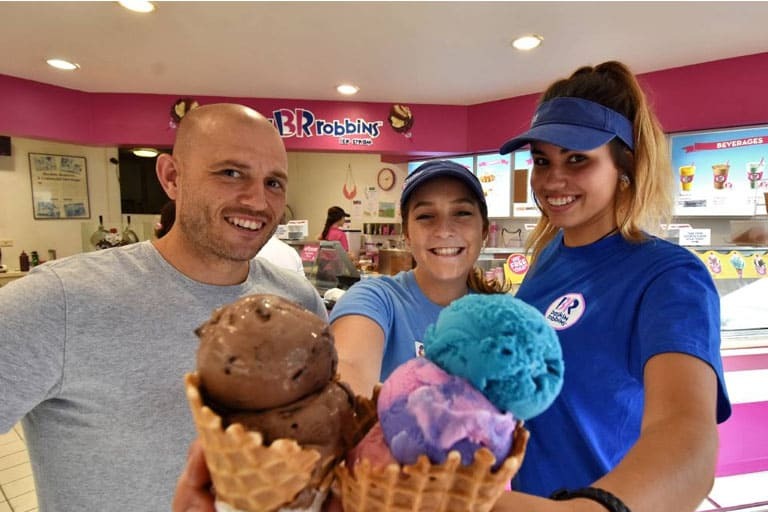 With its promise to keep employees as part of the family and its old-fashioned flare, it’s no surprise that Baskin Robbins keeps drawing new fans every single day. The following are interview questions you may encounter if you are being interviewed for a position as a crew member. This is a question that a hiring manager uses to discover the intent of the person applying for any position. 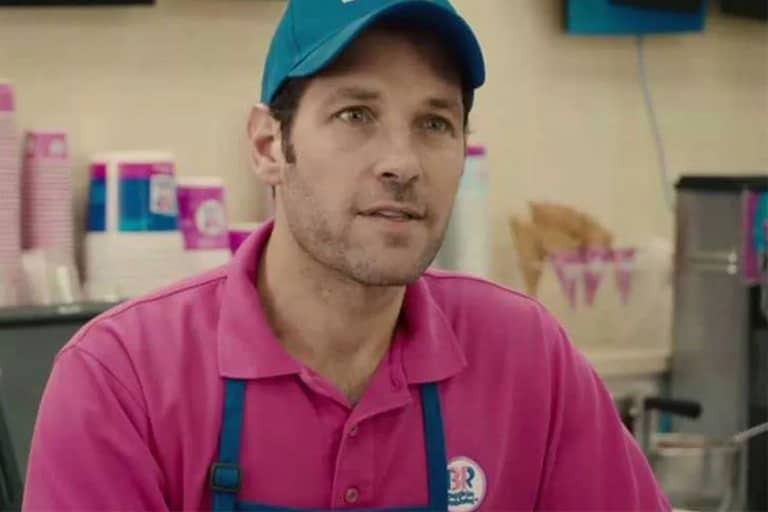 Since most jobs at Baskin Robbins require customer service, mention your ideals concerning being a people-person and wanting to make someone smile when they get an ice cream cone. Also, because Baskin-Robbins is an ice cream haven, mentioning your love of ice cream and how much you appreciate the vast selection of flavors the company offers. Conflict resolution is an important aspect of any service-related position. Whether working as a bank teller or as an ice cream scooper, there will be moments when a customer walks into the store with a less-than-pleasant attitude. Every hiring manager wants to know the person they are hiring has qualities that align with their brand. Because the Baskin Robbins brand relies heavily on good customer service, stating things like being a great communicator, working well under pressure, and multitasking are great strengths to emphasize. When answering questions about your biggest weakness, always soften the blow by stating that you are actively working on ways to improve. Hiring managers understand no employee is perfect, but they want one that acknowledges their weaknesses and is actively looking to improve upon them. The following are interview questions you may encounter if you are being interviewed for a position as a team leader. If you’re applying for a team leader position, being able to provide specific examples of previous experience in a leadership position is imperative. For example, if you were the lead customer success manager at an agency, that is something you would want to tell the hiring manager during your interview. If you do not have past leadership experience on the job, then referencing special clubs or organizations you are involved in can also be a great choice. Being able to make tough calls is one of the most important aspects of being a good leader. Before going into your interview, reassess your time as a leader to figure out what difficult decisions you made in the past for the better of your team. Also, be ready to explain why you made that decision thoroughly. The following are interview questions you may encounter if you are being interviewed for a position as a manager. For this question, it’s important to state all the pertinent experience you have for this position. If you don’t think it’s an important thing to say, then it probably should not be said. Keep it simple and factual. Before going into your interview, make sure you think about your professional goals. Regardless of which company you’re applying to, this question is common. Since you’re applying for the position of a manager, stating that you would like to branch out and have your own franchise of this company is something that a hiring manager would find helpful when picking a future candidate. While this tip might seem like a no-brainer, practicing is key. But the more you know about the company and the more you practice answering these questions, the more confident and free-flowing you will be during the actual interview. While it’s impossible to know every single question that will be asked of you during an interview, having solid answers to questions such as “tell us about yourself,” is a must. You want the conversation to be casual, so making sure you do not come off too rehearsed is also important. Also, dress for success. Appearances matter, especially when you are performing a job where you will be in front of many people. Making sure you got a haircut, ironed your clothing, and buffered your shoes is a great way to make a visual impression on your potential boss. Bosses notice everything from the second you walk into their store. The internet is a great resource. Although many people use it to watch entertaining cat videos, with places like Yahoo and Google, you can find employee testimonials, mock interview questions, and even detailed interview experiences. Sometimes, listening to the experiences of others can help a potential candidate figure out their style and manner of answering questions. Being able to see how current or former employees answered questions can help when drafting and coming up with your ideas. Finally, make sure you come with a list of questions to ask your future employer. Every interview ends with the hiring manager asking a candidate if they have any questions about the position. This is your opportunity to make sure that this job is right for you. Ask questions about scheduling, company culture, turnover rate, and starting salary. If any of those questions or not answered to your satisfaction, then it is a clear sign that this might not be the right job for you. Remember, this is the time during the interview where you are in control and get to interview your potential boss. Like the old adage says, “knowledge is power.” Making sure you’ve given yourself enough time to prepare for an interview is the best way to make sure you’ve given yourself a fighting chance. By running through mock questions and practicing eye contact, you’re sure to make an impression on your future boss. An important aspect of success is visualization, if you walk into your interview feeling overwhelmed and as though you will fail, that’s the result that usually follows. If you walk into your interview feeling quietly confident, knowing what you will say, and having a positive outlook, things might go your way. Though it may be difficult, try to make an interview as fun as possible and think of it as a simple conversation where you have a chance to speak highly of yourself and your qualifications. Imagine that you’re speaking to a friend instead of a potential employer. Hiring managers see dozens of people in a day, but if you can make your interview feel more like a conversation, they will remember you.